Unit-ed October: 2018 Community Painting Challenge. Also, Orctober/Orktober. Community Round-Up | Azazel's Bitz Box. Faust of Double Down Dice completed a hefty contingent of Dwarf players from his Dwarven BloodBowl Team. Looking striking in their regal colours of Gold and Red on their clean Astrogranite bases, they’ve come up amazingly well for a set of figures that has given our friend such headaches over the months. I’m sure you’ll agree with me that the effort was worthwhile, and that Faust should get some more of the 21(!) models that he has for these guys done as soon as he can. The Death-Roller would work a treat for Mechanical November, too! Then the Star Players for December’s challenge… I understand that these Dwarves are also very fond of Orctober as well, though they call it “hunting season” for some reason? Speaking of both Orctober and Blood Bowl, Suncar of The Suncar Vault completed his Orc Bloodbowl Team – the Badland Rockerz. If only they weren’t separated by the Atlantic Ocean and a fair bit of land, they could square off against Faust’s Dwarf Boys for a traditional grudge match. Suncar’s models are mostly the classic 2nd Edition Blood Bowl models that date from my own introduction to the game, accompanied by the Bloodweiser Goblin and a Sculpted-from-scratch Rock Troll. Tarmor’s Unit of Orcs – with a Goblin lackey! Continuing the Orctober theme, Tarmor, of Dragons of Lancasm completed this dual-challenge unit of Orcs for both the month’s Unit-Ed October challenge as well as Orctober. He’s gone for a different shade of flesh to that which many GW players would be less familiar with, but has its origins in older games and literature. 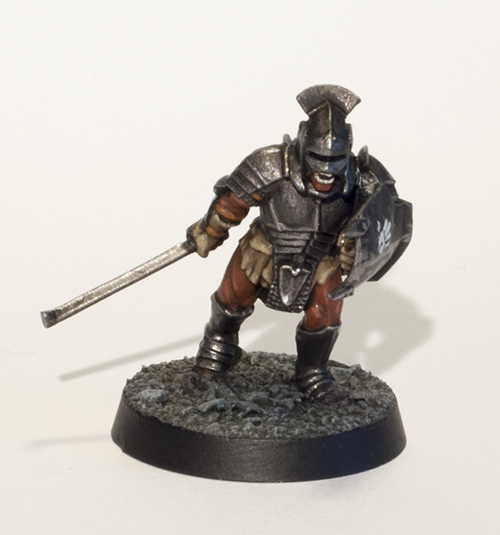 I think it looks pretty bloody good and although I’ll be continuing to paint my own GW orcs like GW orcs, this is another shade I’ll add to the ways I paint my Middle-Earth Orcs. Tarmor’s Orctober orcs shown above are a followup to his September batch of Orcs. mcmatilla’s Ironskull’s Boyz, from Shadespire. mcmatilla completed a unit for the month’s unit challenge, as well as a couple of bonus standalone models for Orctober. First up, we have the Ironskull’s Boyz warband, from Shadespire done in an exceptonally bright orange, yet managing to actually pull it off. 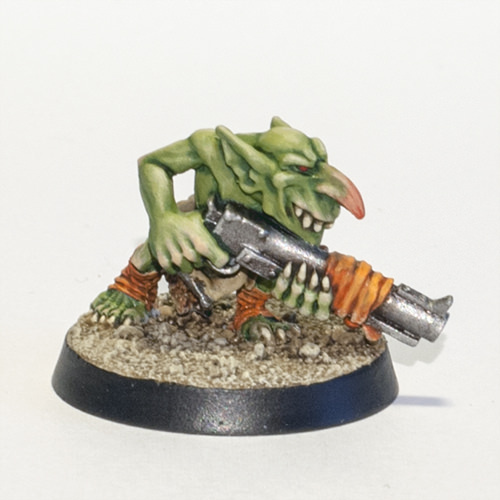 mcmatilla’s Gretchin with a shoota. mcmatilla additional models are a very nicely done Grot (Gretchin, aka 40k Goblin) and an Uruk-Hai warrior from Lord of the Rings – both featuring some lovely blended highlights. Buck Surdu’s Dad’s Army in Civvies. Buck Surdu’s Dad’s Army lads in their Home Guard kit. Buck’s female defenders of Little Baisley by the Sea. …and a collection of civilians from Little Baisley by the Sea. Buck’s Power Armoured infantry from Reaper Miniatures. The Imperfect Modeller’s Kelly’s Heroes. Pete S/ SP’s Rhodesian African Rifles. PeteS/ SP also had a busy month – completing three distinct units. Firstly a platoon of 20mm Rhodesian African Rifles from Under Fire Miniatures. Pete S/ SP’s Royal Ulster Constabulary. Pete’s next unit for the month is a 1970’s-early 80’s-era set of Royal Ulster Constabulary, this time from Elheim miniatures. And finally, Pete completed this platoon of British Expeditionary Force from 1914, by Lancer Miniatures, again in 20mm. Pete certainly added an impressive number of painted models to his various forces over October. Maenoferren22 of the Bogenwald blog completed the painting of a 10mm Mongol army worthy of The Golden Horde. The models might be tiny, but as someone who has tapped out while trying to paint stands of 15mm Flames of War infantry, I can only offer admiration to someone who has the drive to get through so many, many tiny mans. One of Mark Morin’s two infantry squads of Space Roos. Mark Morin, New England’s finest, never does things by halves as we all know by now. Ask the man to paint a squad or unit of 3+ models, and he’ll bloody well create a platoon worth of models. Including officer commanders. Then paint them. Which is what he did. Mark’s boundless enthusiasm and apparently tireless work ethic created the Space Roos force that will no doubt see a ton of action in games of his comrade Buck Surdu’s Combat Patrol skirmish ruleset. Because these guys write and publish their own rules. Because of course they bloody do. Mark’s post goes through the process of not only the painting, but the creation of these unique figures. (I think for Mechanical November, Mark is probably building an actual working full-sized Mark I Tank.) There’s also something about a team winning a game of rounders in there as well. 😉 This marks Mark’s second Aussie-themed wargaming force, the first being his Ral Partha Roo-Mans. Thomas’ Old One-Eye, flanked by three other Carnifices. Ellen’s guest-star Carnifex. Just visiting the round-up post. And Speaking of Tyranids, Ellen from Lavender Miniatures and Gaming has been working on a substantial batch of 40k’s favourite space bugs. Her first completed unit is made up of 10 Hormagaunts, leaping from their bases and somehow not topping over for at least as long as it takes to take the above photograph. her post also features a Carnifex that, while strictly speaking isn’t part of the October Challenge, is too nice looking to not add in here as well, and hell, it fits in with the Carnifex-tastic theme set by Thomas’ contribution above. Roger’s completed Mantic Dungeon Saga collection. Roger from Rantings from Under the Wargames Table completed quite a project this last month – all of the models from Mantic Games’ Dungeon Saga Boardgame. While the link here only goes to the final post of the painting saga, It’s well worth checking out the preceding series of posts to see Roger’s progression through painting a similar but quite disparate collection of models over a period of time. Pandora’s Bitz Box’ Thousand Sons Rubricae Squad. Pandora’s Bitz Box, of the team behind the Krakendoomcool Blog completed a unit of Thousand Sons Legion Rubricae Chaos Marines of Tzeentch in October, including their attached Sorcerer. So many thin, thin lines of blue and yellow there – but a favourite aspect of the squad for me is the shimmering effect on the Sorcerer’s Force Sword – kinda like reflections but also kind of like arcs of eldritch power going up and down the two sides of the blade. Argentbadger of The Bovine Overlord completed a unit composed of a Krielstone Bearer and Stone Scribes from the Trollbloods faction of the Hordes wargame. There’s a definate Obelix vibe coming from that Krielstone Bearer. I think it might be because he fell into the cauldron of magic potion when he was a baby. And now, for the first time I’m thinking about it and wondering why all Gauls didn’t get dunked into the stuff as babies. Rome would never bother them again! Dave Stone of The Gamer’s Cupboard completed this unit of Tusken Raiders (or Sand People) from Star Wars: Imperial Assault. I really like the different tones of sandy brown and ochre that he’s achieved in order to differentiate between the inner and outer robes. Dave has a whole lot more of the Imperial Assault stuff happening on his blog right now, so if you’re interested in the Star Wars, I’d suggest checking it out! Wudugast hits the full squad of 10 for his truescale Knights Mortis Space Marines. Wudugast of Convert or Die (seems an easy enough choice, really) has had a bit of a huge month in October – completing enough additional models of his Knights Mortis Chapter true-scaled Space Marines based on Primaris models. The addition of the very nicely posed Sergeant as well as the flamer marine on top of the regular troopers finishes off a rather striking unit. Will we see an officer or specialist next? Wudugast’s Orktober contingent of 40k Orks. Not to rest on his laurels or anything, Wudugast has also added a pretty impressive chunk of green to his 40k Ork force for the Orktober theme of the month. 5 Boyz and three Nobs makes a second and third completed unit by my count as well, while the rather menacing Deff Dread would cover the Dreadtober challenge (run elsewhere), so Wudugast has truly been all over it in October! The Orky link there leads not only to individual shots of these boyz, but also a bloody impressive full army shot of painted Boyz and their Toyz, which just makes me jealous! Wudugast’s Squigs with their herder team. A big block of Wudugast’s Goblin Spears, with some netters and a few other oddballs thrown in for good measure! Wudugast added in the nicest looking one of this Rat Ogre foursome in October. And finally, Wudugast added one more Rat Ogre to create a unit of four when grouped up with his previously finished models. As a little bonus, there’s also Comrade’s Wargames‘ PatrickWR‘s models for Orctober, which I missed at the time (due to lack of linkback). There are the foursome of Orcs, and also their Goblin boss. In my opinion, I think the Orcs especially came out exceedingly nicely. My own contributions for October can be found in more detail in my Personal Round-Up Post, but for completeness’ sake, here they are, standing on top of Skulltown Hill. Bloody hell. This month’s round-up has been an epic task taking quite a few hours to assemble. I’ve even managed to get it up on the second weekend of the month, which I think is actually pretty reasonable, as I try to get my personal round-up done on the first weekend of the new month, and then give people a few days or a week’s leeway to get their stuff varnished and photographed and posted. Every time I’ve thought I was done with this post, I’ve found another couple of posts or contributions that I’d missed in my last session. There’s even one or two up there that I somehow remembered, despite them not linking to finished models in the original signup post. I’ve gone through that post a couple of times, doing my best to not miss anyone out. If I did manage to miss you out, despite my best efforts, please do post in the comments below and I’ll add you in as soon as I’m able to do so! 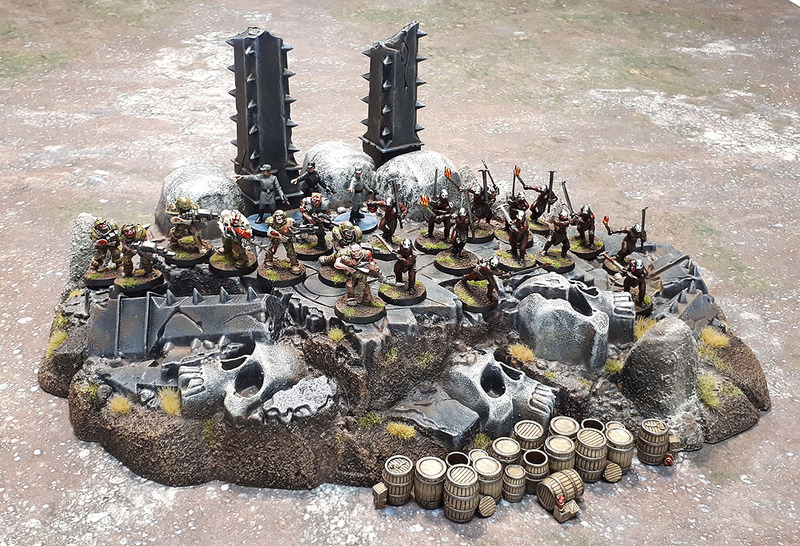 This entry was posted in Monthly Painting Challenges, Monthly Painting Round-Ups and tagged Community Painting Challenge, Monthly Painting Challenge, Orctober 2018, Orktober 2018, Unit-ed October 2018. Bookmark the permalink. That was bloody mentally long! Seemed like a much bigger haul than usual, very cool to see how many people contributed to this Round Up. Well done everyone! Well done everyone, this is a great way for me to follow other people’s blogs, rather than seeing who liked a post and having a snoop. Big thanks to Azazel for the work put into this. As I am new to your blog I thought that we posted onto your post as a reply. I hadn’t realised that you redid the whole thing. A truly excellent month! All brilliant! Once again, Azazel, thanks for the round up, I thought I’d save you some time by failing to complete anything myself! That’s a lot of stuff getting done this month! Well done everyone, I’m impressed. And as always a big thank you to Azazel for the time and effort put into making these challenges and roundups happen. Great work everyone- there has been a lot of hard work put in by lots of people. Thanks for all the tedious work you put into this round up Azazel! Truly, give yourself credit against your goals for at least a couple of painted figures 😃! Glad to see my buddy Buck in there too. He’s at Fall In now winning awards for his games and rightly so. Such a great and collection of work from very talented folks across the spectrum of gaming and modeling. I am honored to be part of such a group. Thanks Azazel, if you’re ever up here in New England, there’s beer and large lobster for ya! Thanks… I’m thrilled to finally have them painted after a decade or two. 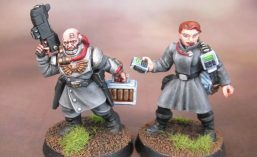 Thanks too to Azazel (and all the other painters) for such an impressive round-up! Excellent work all around! Next month, I should be back up there again, but they way my batch painting went in October, nothing actually got finished, even tho much progress was made. Wow, have to say I really enjoyed me first browse through all the Orc themed minis. I didn’t think I would enjoy seeing the results of that theme as much as I did. The non-Orcs are also amazing. I’m definitely going to go through and look at everything in more detail, once I’m off toddler watch. Thanks for the entertaining write-ups and putting this all together, Azazel! It’s always such a nice cap to the end of a project. Wow! Wow! so many beauties there, fabulous work from every participant. I really enjoyed reading this post and admiring all the entries. I can see an immense level of effort and skill put in. Well Done everyone!!!!! Can only echo what everyone else has said, great work all round and as always special thanks to Azazel for the challenge and the work put in to bring it all together. Respect my friend. Thanks mate. Insane to see how many units got completed by this little community – even knowing that many would have been done anyway to think that the challenge helped others get done this month is pretty humbling. Wow, what a lot of productive people this month. I can only echo what others have said, great to see so many people producing so much great stuff, well done to everyone and thank you again for organising these challenges – I can categorically say that many of mine wouldn’t have been finished without it. Wow there is some truly outstanding work on show here Azazel! as everyone else has said thanks so much for organising and colleting all of this, I am humbled to be in such esteemed painters. A staggering amount of minis finished by a staggering amount of painters (I counted 17 authors?)! As everyone else, I want to thank you Azazel for doing these challenges and taking your time to write these round-ups, it’s no small feat. Thank you also for your kind words on my submissions, they’re always appreciated. Nice work by everyone. I’m not sure if my favourite is mcmattila’s Grot (I love the transition on the nose) or Buck Surdu’s female defenders (the tartan on the one with the spear (?) is amazing).